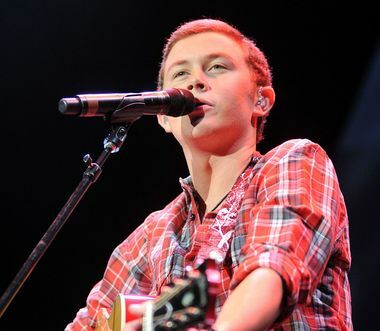 Scotty McCreery performs before The Band Perry and Brad Paisley on the opening night of the "Virtual Reality" tour, Thursday, Jan. 12, at Van Andel Arena in Grand Rapids. GRAND RAPIDS -- Sorry Brad Paisley, all those screams were for the "American Idol" winner Scotty McCreery. Well, not really. But in reality, a lot of girls were screaming. Loudly. 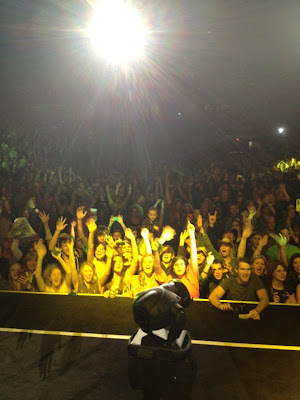 On the opening night of Paisley's "Virtual Reality" tour 2012, the young singer with a deep voice kept those adoring fans very happy during a 25-minute set of songs from his newly certified platinum CD, "Clear as Day." I even tweeted: "Random screams of "I love you Scotty!" 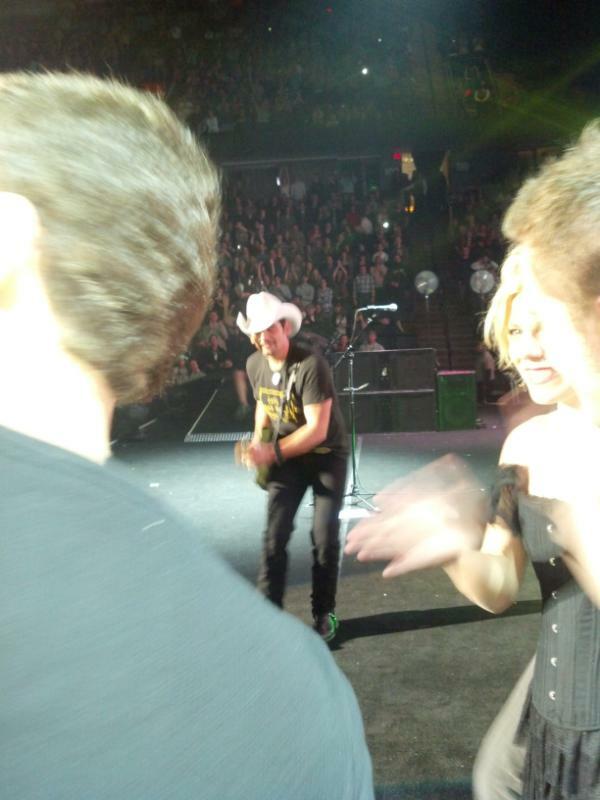 Opening night of @BradPaisley tour." The 11,500-plus inside Van Andel Arena on this winter storm night in Grand Rapids were very receptive of McCreery. But it was clear that some fans came solely to see the "American Idol" winner. Some fans held up signs with marriage proposals. And two young girls behind me were coming unglued, nearly crying when as he performed his songs. I caught up with some fans from the Windsor, Canada, area who made the trip to Grand Rapids, just to see Scotty McCreery on stage. "He's just great," one of them gushed. I guess that's all that really needs to be said. As for Paisley, let me say one word: Amazing. Yes, there were a few opening night glitches. Paisley came in on the wrong key on one song, and said "Ooops." And a curtain that was supposed to come down to project some lasers never properly unfolded. But the whole "Virtual Reality" tour concept of music and technology makes sense and is visually stimulating. Oh, and I loved -- LOVED -- the larger than life Puppet Brad during "Celebrity." I won't ruin it for you if you're going to see the show. But the video and cameo are highlights. Come back to Mlive.com for more on tonight's concert and a photo gallery. Other highlights: @BradPaisley forgettin lyrics to "Letter to Me" & tellin @ScottyMcCreery that high school ISN'T the best time of his life! @ScottyMcCreery loves Grand Rapids this big!!! Scotty McCreery hit the stage toight opening for Brad Paisley. 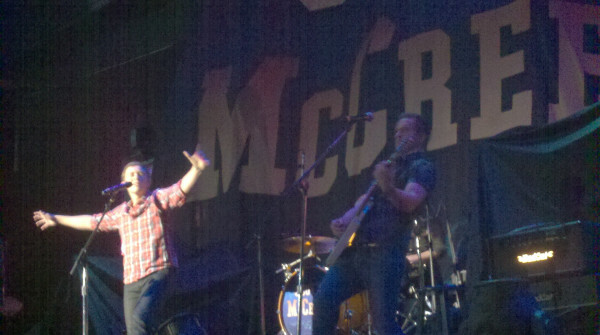 According to twitter, Scotty was in plaid, and KILLED IT ON STAGE. From what twitter fans were saying. 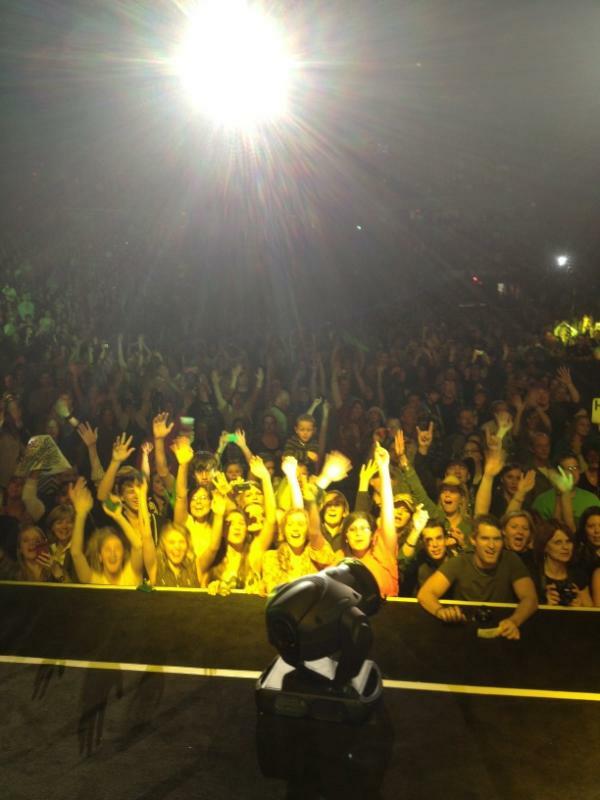 Here are some twitter pictures from the stage. @ScottyMcCreery asking girls to write their numbers on their hand. GAYLE!! WE AWAIT YOUR RETURN. Gayle is a reader here at FOS, and she was very excited to be attending Scotty's show tonight. We can't wait for her recap when she returns. Scotty McCreery's life certainly has changed from just two years ago, when he was a high school student and grocery store clerk who enjoyed playing baseball and hanging out with friends in his hometown of Garner, N.C. 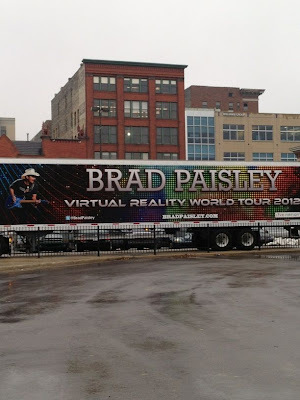 Since that time, the 'American Idol' winner has seen his debut album, 'Clear as Day' debut at the top of the charts, and he's set to hit the road with Brad Paisley beginning tomorrow night (Jan. 12), for Brad's Virtual Reality world tour. But the 18-year-old insists that, even though everything seems to be going his way now, he isn't about to just sit back and enjoy the ride anytime soon. "Being aggressive is something that needs to happen," Scotty tells Minnesota's Star Tribune. "Even when I was on the show, I remember talking to the producers saying that I want my album to come out quickly because I don't want the people forgetting about me. I'm going to work my tail off. The teenager says he learned a powerful lesson about his career from playing his favorite sport. "One of my sayings from my baseball days is 'Go big or go home,' he notes. "We want to go big. Right now, we're just trying to get out there and make sure people know we're still around. My dad pitched in college and he raised me on the pitcher's mound. If you're the pitcher, all eyes are on you -- everybody in the stands and the team is depending on you. Being onstage and having all eyes on me, it's kind of a transition from baseball to the stage for me." The singer with the distinctive bass voice admits that while he's not opposed to recording love songs, he had to include tunes on 'Clear as Day' that were real to him, which was a bit challenging since he's not all that experienced in affairs of the heart. "I've only had one serious girlfriend," he concedes. "And it was a 13-year-old http://www.blogger.com/img/blank.gifserious relationship, so it wasn't too much. I've kind of been flying solo for the last few years. But heartbreak is heartbreak, whether you're 18 or whether you're 40." Scotty may be getting aggressive with his music career but he isn't putting his academic aspirations aside. He plans on pursuing a college degree, even though he knows it may be a daunting task. "College is important to me," he states simply. "Education is important to me. You never know how far your job can take you." American Idol Scotty McCreery will be doing a live chat with our listeners on Saturday, January 14th at 4pm Central time! Be here to watch and ask Scotty questions! Here are instructions for the first Fans Of Scotty chat, Chat will officially begin at 6pm, but is open now for you. Hope many of you join us after 6pm! 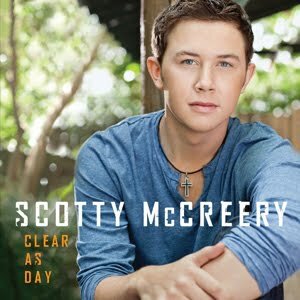 After releasing two ballads from his debut album ‘Clear as Day,’ Scotty McCreery supporters are hoping the singer sends one of his more uptempo songs to radio as a single. However, it’s not just fans that are calling for something a little more fun. The singer’s parents say they want an upbeat track to be chosen next as well. A recent article in the print edition of the Raleigh, N.C. News and Observer says Judy and Mike McCreery like ‘You Make That Look Good’ as single No. 3 for their son. The Keith Urban co-written ‘Walk in the Country’ seems like another possibility, as McCreery performed it at the CMA Awards in November. Talk of a third single may be a little premature, however, as ‘The Trouble With Girls’ is still climbing the charts. Currently, the song is at No. 23 on the Billboard chart, looking to top his debut single ‘I Love You This Big,’ which reached No. 15. Both songs should be certified gold for over 500K copies sold by summertime. ‘Clear as Day’ was just recently certified platinum. Congrats @ScottyMcCreery on goin platinum! Very cool man. Not an easy thing to do these days. GARNER -- The honors just keep coming for Garner's Scotty McCreery, whose first CD has just gone platinum. "Clear As Day," released in October, has sold more than a million copies. 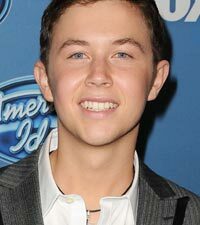 “It means the world to me,” said Scotty, 18, who became the winner of Season 10 of "American Idol" in May. “It’s one of the highest honors you can get with your album, and it’s a huge testament to the loyalty of country music fans and how great they have been to me." "Clear As Day" had previously received gold record certification, meaning 500,000 copies sold. It debuted at No. 1 on both the Billboard Top 200 and Top Country Albums charts. It was No. 1 on the country chart for six weeks, and it received the highest sales of any country solo album released in 2011. Scotty also has received a gold record for his first single, "I Love You This Big," and and his second single, "The Trouble With Girls," is approaching gold status. The video for "The Trouble With Girls" was filmed with some of Scotty's friends at Garner High School, where he is a senior when his busy schedule allows. 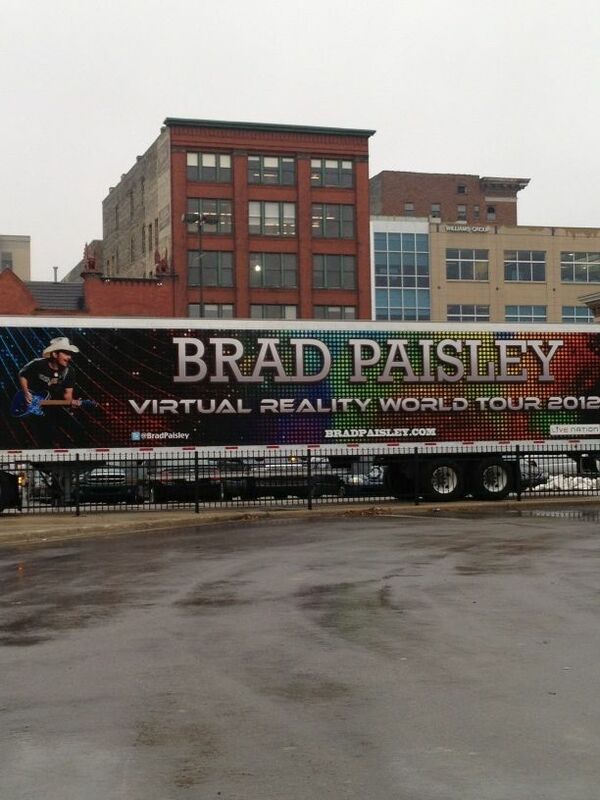 But this week, he begins a tour with country superstar Brad Paisley. The tour, which starts Thursday in Grand Rapids, Mich., will take Scotty across much of the West and Midwest until early March. The closest date to North Carolina is Baltimore on March 1. Scotty's parents, Mike and Judy McCreery of Garner, will take turns accompanying him on the tour stops. Don't worry that his time away from school will affect his studies. Because of tutoring he received during his time on "Idol," Scotty will be graduating with his Garner High class this spring. "I'll be walking with them!" he said in an interview last month. 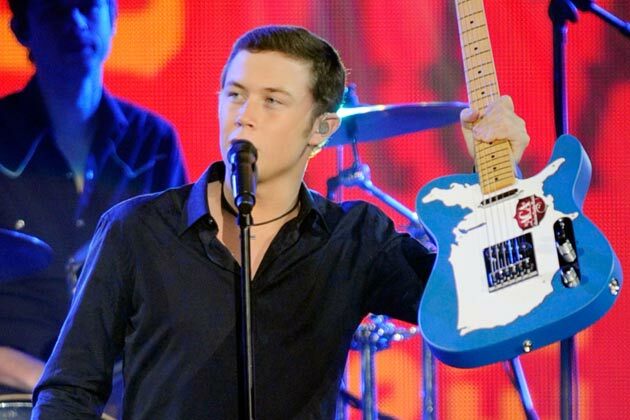 Scotty McCreery Grand Rapids Mich Tour Updates and Information. Snow!! Tonight is the night, Scotty takes the stage for this first time opening for Brad Paisley. I'm still trying to find out what time EXACTLY Scotty hits the stage. His set is expected to last 30 min long, and will include TTWG, ILYTB, Dirty Dishes, and others off of his debut album. Hopefully things will work out for tonight, the Midwest is apparently being hit by a pretty big snow storm, so if your traveling to tonight's show, please be careful and take extra time to get there. Scotty is on first, so you will want to leave extra early to make his set! Our CHAT ROOM will be open at 6pm tonight, and the link will be right here on the front page. We will be watching twitter, and other news outlets for any bit of information about tonight! So, please join us tonight for our first Fans Of Scotty open chat. THE INTERVIEW IS NOW OVER. Mike McCreery called into QDR this morning for a quick interview. He says Scotty is a low key person, and doesn't really show if he is nervous, so it's hard to say if he's nervous for tonight's show. He's ready for the show, and after tour he will return to school with some other shows thrown in there. Mike is not with Scotty tonight, but Mrs. McCreery is with Scotty. I missed the beginning of this interview, so hopefully QDR will post the full interview on their site. We'll put it up if they do. http://player.streamtheworld.com/liveplayer.php?callsign=WQDRFM Listen live now. I will update what he says when the interview is over. Also here is his other performance from that night, The Trouble With Girls.